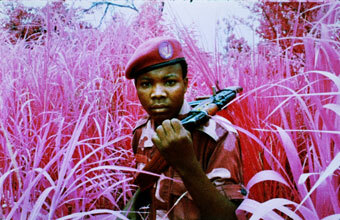 Film still from The Enclave, 2012-2013, showing a rebel from Mai Mai Yakutumba posing in Elephant Grass in Fizi, South Kivu, eastern Democratic Republic of Congo, 16 mm infrared film transferred to HD video, 39 minutes 25 seconds, Produced in eastern Democratic Republic of Congo, Director/Producer: Richard Mosse, Cinematographer/Editor: Trevor Tweeten, Composer/Sound Designer: Ben Frost, Courtesy of the artist and Jack Shainman Gallery, New York. Hear insights from Mercy Corps’ Mark Dwyer, Democratic Republic of Congo (DRC) Country Director, and Solenne Delga, Senior Director of Emergency Programs, on the current geopolitical environment, their personal experiences working in Congolese communities, and what Mercy Corps is doing to meet the immediate and long-term needs of families displaced by conflict. Mercy Corps, the Portland-based humanitarian agency, has a long history of working to save and improve lives in over 40 countries. Mercy Corps teams have been working in the DRC since 2007. The second-largest country in Africa, DRC is as rich in natural resources as it is beleaguered with political instability and decades of wars and conflict. 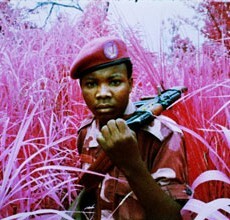 Lecture in conjunction with The Enclave: Richard Mosse, on view November 8, 2014, – April 12, 2015. Organized in partnership with Mercy Corps. Members free; non-members $15, seniors and students $12. Advance ticket purchase highly recommended.